Aisha Buhari, the woman whose name and passport is being circulated by online supporters of the ruling All Progressives Congress, APC, as the woman mentioned in the William Jefferson bribery scandal has denied any involvement in the case. In a report by The Street Journal, Ms. Aisha Buhari told the news magazine that her passport was stolen in 2015 and that Nigerian politicians were dragging her name into this scandal to cover up their corruption. Online newspaper, TheCable, had reported the story exclusively showcasing Ms. Buhari’s passport.An individual, who identifies as an All Progressives Congress supporter, had shared the full image of Ms. Buhari’s travel passport to one of The Trent’s editors on Tuesday, June 21, 2016. 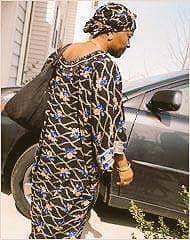 He claimed that the woman in the photo was the Aisha Buhari mentioned in the William Jefferson bribery scandal. Normally, we wouldn’t publish this image, but it has already been circulated widely.An APC supporter shared this image to one of The Trent’s editors in an attempt to refute Governor Fayose’s claim that Aisha Buhari was involved in the Halliburton ScamMs. Buhari reportedly stressed that though she shares the same name with the wife of Nigeria’s president, Mrs. Aisha Buhari, she’s not the person mentioned in the bribery scandal. She described the circulation of her name and image in the scandal as malicious and wicked.She said that her personal date provided in the news reports were taken from her stolen passport. She also maintained that she lives in the United States of America and travels “in and out” of the country without any problems, maintaining that one involved in such a scandal would have been apprehended by the US law enforcement agencies.She said that dragging her name into the scandal “is like pouring water on a sleeping person. "I have never done anything with Halliburton, I don’t know the colour of the company. I am not in the line of business with Halliburton, so linking me with the bribery is wicked”.“They are desperate to cover their dirty track and link my name with the scandal that they have to first of all steal my passport. My passport was stolen early this year. And to give credibility to their story, details from the passport were used. They should come to the US, to find out If they are curious about the case”, she said angrily. “If somebody commits crime in the US, he or she must face trial. Have you heard I am being tried in the US?”Let them stop this malicious allegation against me that they do not have proof of, I hate people who do not cross check facts before talking, they should find out in the US the kind of person I am because I belong to organisations there.“If they think they are politician and can break the law and go free, they should realise that nobody is above the laws of a country including me. When asked if Ms. Aisha Buhari would take legal action against the people circulating her image and passport and linking her to the Halliburton scandal, ”I am talking with my lawyers, they will determine that”, she said.